The first update after big QuickGene's release, just over a month ago, introduces some smaller changes and improvements. The most popular request was the ability to disable translation of the complement strand, which has been added as a view option. The enzyme database has also received a major overhaul, including the extensive changes to the New England Biolabs buffer recommendations and introducing the EcoRI buffer activities for all NEB enzymes. Another useful new function is the intelligent annotation of features when opening GenBank files. You have likely encountered the problem of opening annotated GenBank files only to see all the features named "CDS" or "gene". This is common for files that have been saved or modified in programs that save the name incorrectly. QuickGene uses the correct names and, when these can't be found, deduces names from other specifications of features, attempting to provide you with the most descriptive annotations possible. In the meantime, some bigger, research-enhancing features are approaching completion which you can expect to see next month's update. Stay tuned! In-line search results can now easily be converted to features by double-clicking on them. Translation of the complement strand can now be disabled in the view options. Updated the enzyme database, including major changes to the NEB buffer activities and recommendations. Improved security and reliability when activating and updating QuickGene. Updating QuickGene now shows its progress. Improved naming of features when opening GenBank files. 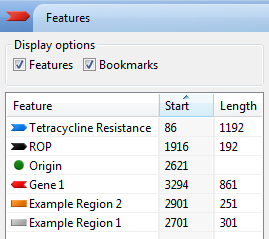 Fixed the base pair location in the status bar to update when clicking on enzyme tooltips. Fixed certain cases where composite features could cause problems in QGProject files.